The Jackery PowerBar is a rugged little battery pack with an AC outlet onboard that charges devices quickly and efficiently across the board. Jackery has a whole host of chargers and battery packs ranging from small cell phone chargers to full-fledged generator replacements with Honda branding, but the one we're most interested in is the PowerBar. 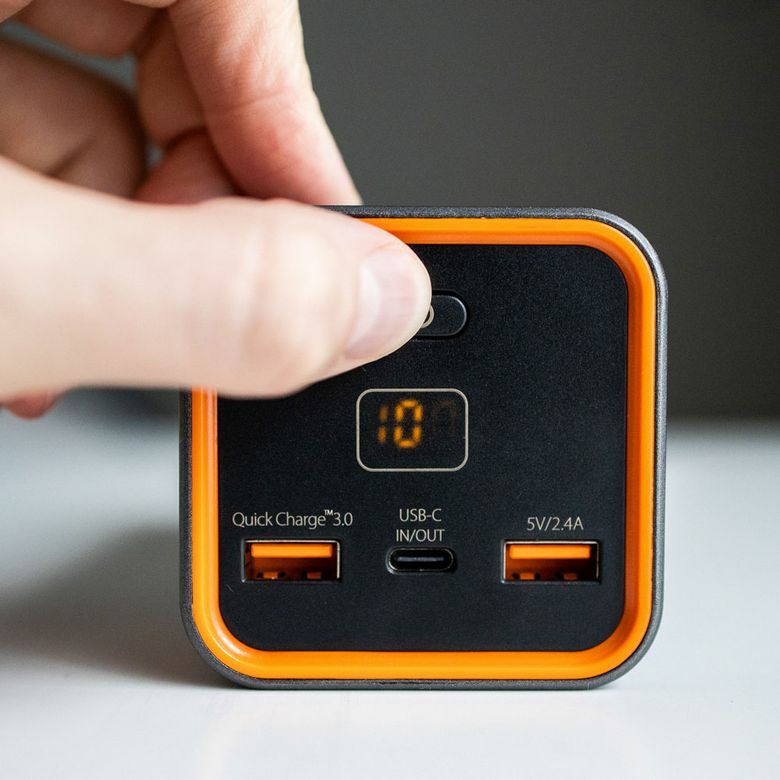 This cuboid battery pack features multiple USB ports for charging mobile devices and laptop as well as a full-fledged AC wall outlet for laptops and other devices that require a traditional wall plugin. To see just how well Jackery's PowerBar is, we put it through a workout testing everything from its durability and build quality to how long and fast it charges both laptops and mobile devices. One look and it's easy to see the PowerBar is different than most battery packs you see on the market. Rather than the more rectangular design we're used to seeing, the PowerBar looks more like a boombox with a squared-off design. Initially, the design seems a bit out of place, but the more we used it the more we realized the benefit of the squared design. For example, when using larger block-style laptop chargers, such as the big white blocks that come with MacBooks, the square design makes it easier to plug in the adapters to the AC port without making the battery pack too lopsided where the plugin would otherwise come undone. The one downfall of the PowerBar's shape is that it doesn't fit inside backpacks as easily as flat chargers. Instead of putting the battery pack inside the backpack where we normally would, we instead had to store it in the outside pockets usually meant for water bottles. Sure, you could make space in the bag, but the absence of a low profile might be a dealbreaker if you're looking for something that's portable. Initially, the design seems a bit out of place, but the more we used it the more we realized the benefit of the squared design. Another set of design details we noticed was slightly out of line details on the battery pack and charger. While it might seem insignificant, various ports, displays, or buttons on the device lined up either vertically or horizontally. On both the wall plug-in the USB Type-C port was off-center and on the battery pack the display was off-center as well as the icon on the power button. Sure, these are small details of the device, but it's these seemingly insignificant details that often separate the best from the rest, so it's worth noting although it makes no functional difference. As you might expect from a battery pack, there's not much to setting it up. After removing the PowerBar from its beautiful, minimal packaging, we took a quick look to see how charged it was. All it took was a quick tap of the power button and the display showed us it was at 58% straight from the factory. Getting started with charging was as simple as plugging in a standard USB or USB Type-C and letting it do its thing. As the battery pack burns through its charge, the screen will show the percentage remaining. To use the AC outlet on the opposite side of the battery pack, all we needed to do was hold the power button down for two seconds. Aside from the display and the single LED button lighting up, the sound of the internal fans kicking on are a dead giveaway that the AC plugin is ready to rock and roll. As previously mentioned, the Jackery PowerBar came approximately half-charged from the factory. To get a solid starting point, we ran its power down to zero and started with a fresh charge to see how long it took. Using the included USB Type-C adapter and cable, the Jackery PowerBar took six and a half hours to charge and averaged that each of the eight times we charged it up from being completely dead. This falls in line with Jackery's six to seven-hour estimate and is reasonable considering its 77Wh/20800mAh capacity. When it comes to mobile devices, the Jackery PowerBar doesn't disappoint. We tested the battery pack with an iPhone XS, a Samsung Galaxy S8 Active, and a Yi 4K+ action camera for good measure. We completely drained each device and charged them with a fully-charged Jackery PowerBar, repeating this until the battery pack was dead. With the iPhone XS, we achieved six and a half charges, with the average charge time being an hour and a half with the onboard Qualcomm Quick Charge 3.0 port. With the Samsung Galaxy S8 Active, we achieved eight full charges with an average charge time of an hour and fifteen minutes using the onboard Qualcomm Quick Charge 3.0 port. The Yi 4K+ action camera was able to charge ten full batteries before the PowerBar ran dry with an average charge time of an hour. Moving onto laptops, we tested the Jackery PowerBar with our 2016 MacBook Pro 15-inch ring the onboard AC plugin (there is a USB Type-C on the PowerBar, but it's output isn't strong enough to charge the MacBook Pro through it). Like our mobile devices, we completely drained our MacBook Pro's battery and started charging it with a full PowerBar. We did this four times over to get a good average. Over our four tests, the MacBook averaged a 73% charge from being completely dead with an average charge time of four hours and fifteen minutes. This too aligns with Jackery's advertised charge level and timing. All in all, the Jackery PowerBar lives up to its estimated charge amounts and times; we didn't see a single discrepancy in our testing. If anything, it charged our devices a bit quicker than anticipated, but it's worth taking into account charging will go much slower and be impacted greatly if you're using the devices while they're being charged. The Jackery PowerBar retails for $129.99. Considering it only has a 77Wh/20800mAh battery onboard, that's not the best value in the world of battery packs, but what you lose in capacity you make up for in convenience with the onboard AC plugin. Thanks to its unique design, the PowerBar does stand out amidst the competition, but it's far from a league of its own in terms of specs and features. Its two closest competitors are the Omars 88Wh/24000mAh battery pack and ChargeTech 27000mAh battery pack, both of which have a larger capacity than the PowerBar and also feature integrated AC plugins. The Omars battery pack retails for $69.99, a full $60 less than the Jackery. However, it only has two basic USB ports onboard and its manufacturer specifically mentions it's not compatible with Apple's MacBook Pro 15-inch because its charging output is capped at 80W and the MacBook Pro draws 87W. So, if you have a less powerful laptop and don't see a need for USB Type-C or Quick Charge 3.0 ports, the Omar battery pack might not be a bad idea, but beyond that, it's quite limited. It'd be nice to see a little more attention to detail in the design and it'd be nice to be able to charge laptops over USB Type-C, but the onboard AC plugin is the selling point here and Jackery has nailed it. The ChargeTech battery pack retails for $199.99, making it $70 more expensive than the Jackery PowerBar. The 27000mAh capacity gives it a decent advantage over the PowerBar and the more book-style design makes it a bit easier to keep in backpacks, but whether or not that's worth an extra $70 is debatable. We also have a full review of the ChargeTech battery pack though, so you can compare the two more thoroughly on your own if you'd like. Simply put, the Jackery PowerBar manages to stand out in both design and features compared to its competition. It falls between its competitors in price, but it also manages to include a few nice features said competitors are missing out on, such as Qualcomm Quick Charge 3.0 and an integrated fan for keeping it cool. See more reviews of our favorite portable laptop battery chargers available for purchase. With a 77Wh/20800mAh, it won't be replacing a wall plugin for your laptop, but for times when you're in a pinch and away from an outlet, the PowerBar will help fill the gap with a little extra to help keep tablets, smartphones, and cameras charged as well. Jackery’s two-year warranty is the icing on the cake. Product Dimensions 6.3 x 2.55 x 2.55 in.